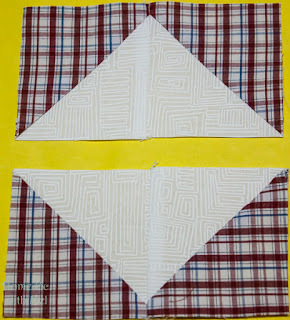 Are you as exhausted as I am after sewing, cutting, pressing and trimming all of those blocks? 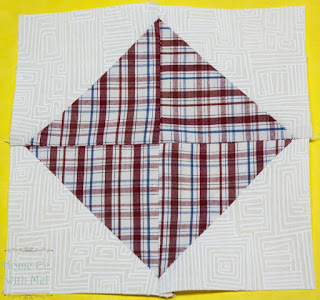 That was a lot of half square triangles to make. It took me a little longer than I had expected. 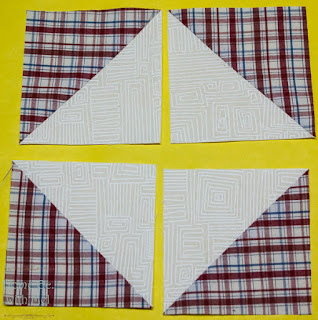 I'm not sure what made me think I could do all of that in a week but that's OK we are ready to move on to our next step and that is turning the half square triangles (hsts) into a square in a square block. 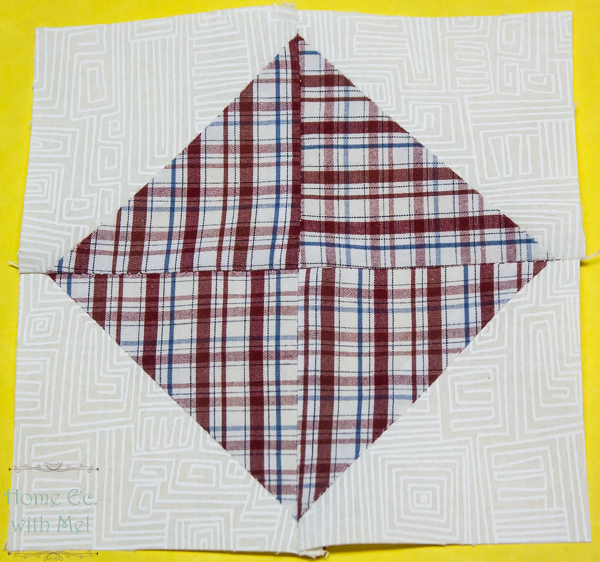 The square in a square block isn't traditionally done with half square triangles but that doesn't mean we can't make them that way. 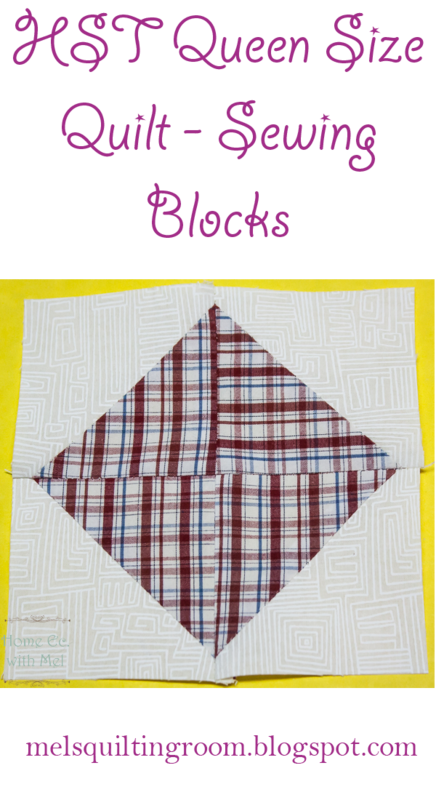 Your block will finish at 5 1/2". We actually are going to make two blocks. 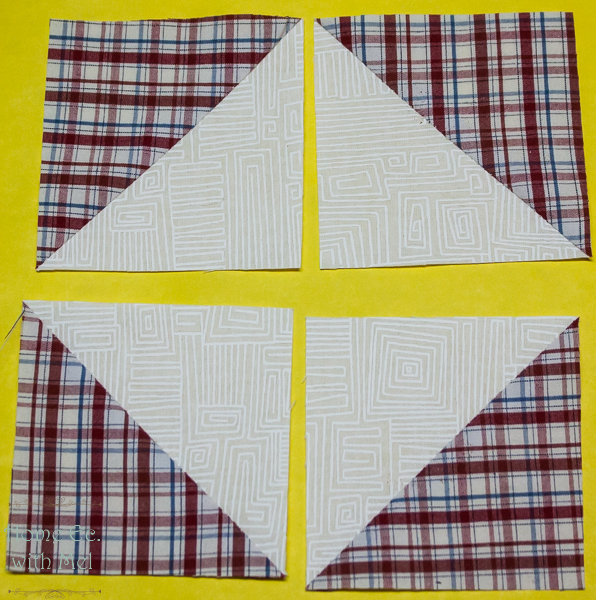 One with the plaid in the center and one with the white in the center. The variance is what gives us a secondary design. 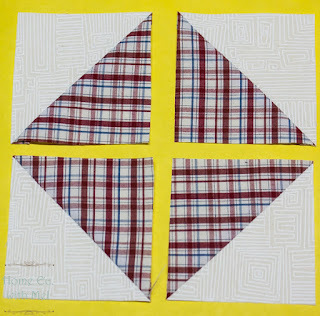 A secondary design is just a second design that pops up in your quilt. 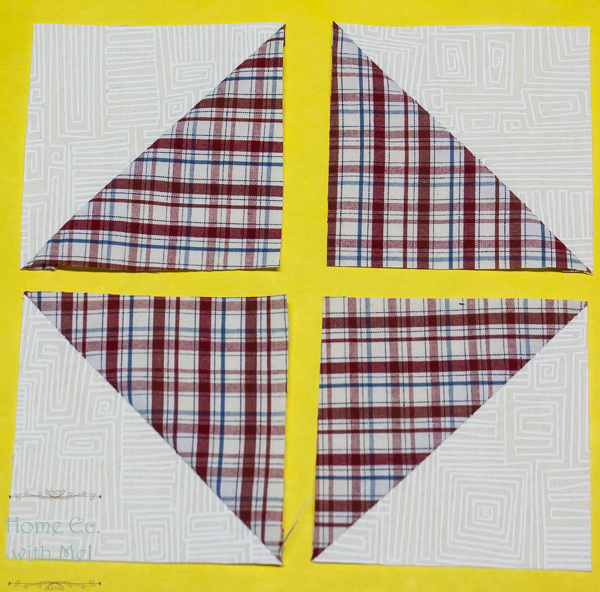 It'll be much easier to understand next week when you see the quilt top put together. So let's make our blocks. 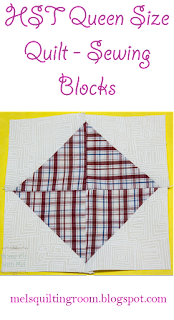 Each block is made up of 4 HSTs. 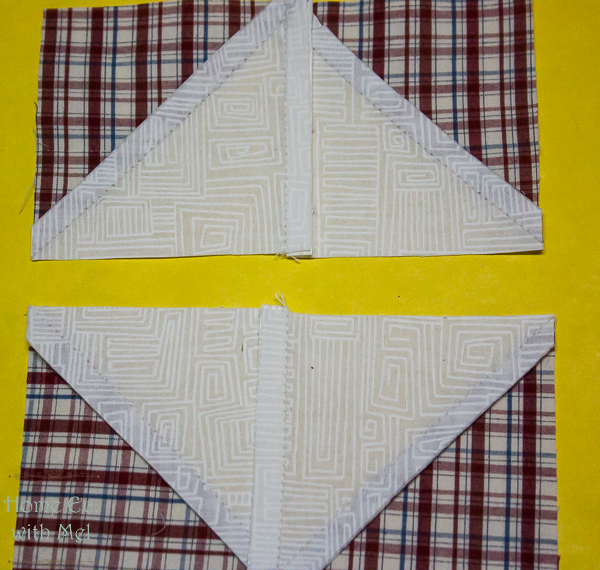 Our first step is to sew the top pair together and then the bottom pair. You need to match the points at the top. Of course I chain sew this so I can get a lot done. When you press them open press the top one to the right and the bottom one to the left. If your points don't match you'll have to rip them out. 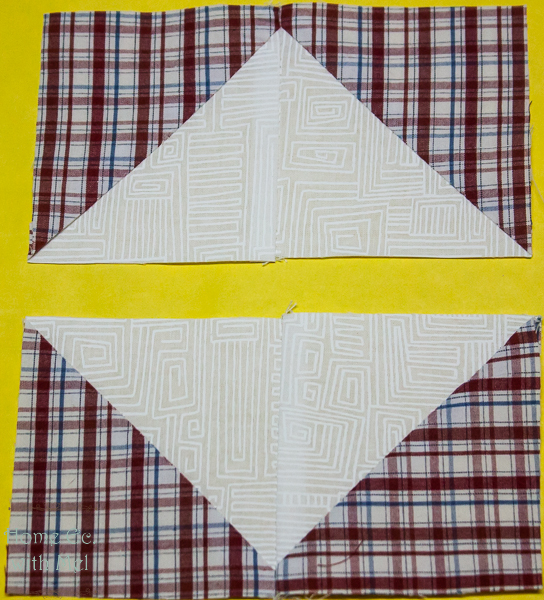 Now we sew the two halves together. On this block we have three spots we have to match. The points on each end and the middle. If you need to pin it do so! The goal is to get the points to match and whatever you need to do for that to happen is fine! That's it! 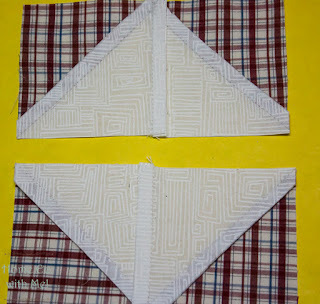 We just need to sew all of our half square triangles into the square in a square. If you need to sliver trim the edges, some of the seams might peek out, that's fine but no other trimming should be done. If your points doing match, you've got to rip them out. I am starting to really like HST's!